One thing about having a blog is that people happily point out how deficient you are on the clue front. As a result, you acquire several more clues than you had before. This happened most recently when I posted about rhubarb. Little Miss Food Authority: Oh boy! Try this marmalade! Planet Earth: It’s COMPOTE, Genius. 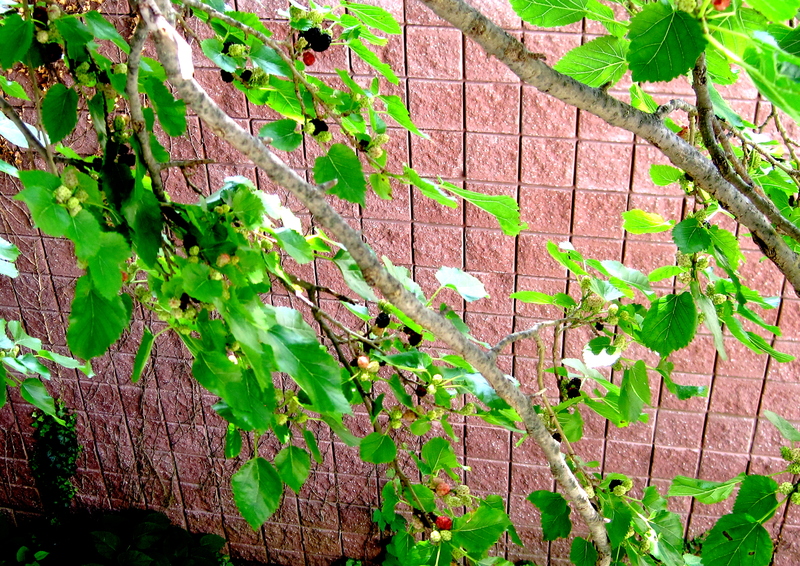 I have a mulberry tree branch that stretches right alongside my upstairs balcony. There is it above. The tree itself is in my neighbor’s yard. The rest of the branches hang over the no-man’s land between our properties and over the firehouse roof next door. All winter I looked forward to seeing the berries emerge, then turn green, then red, then inky purple. In mid-June they did. 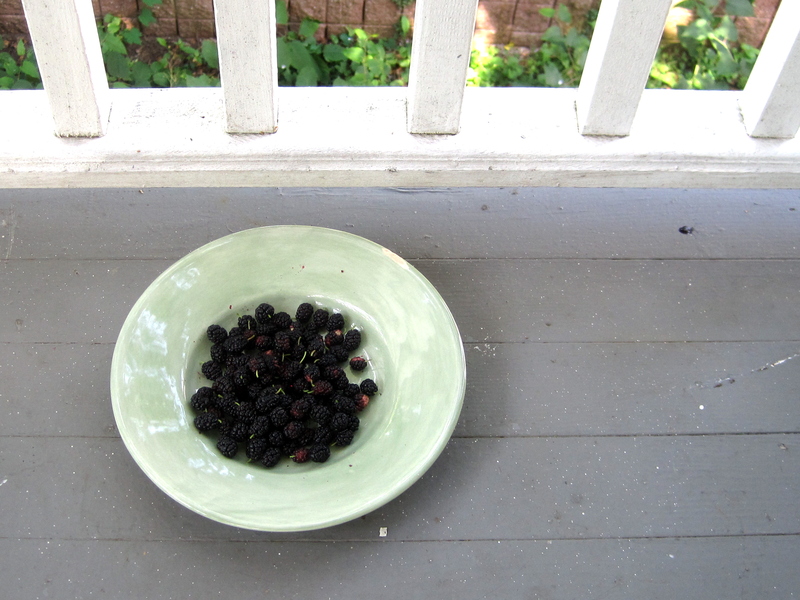 Every morning for three weeks, I took a big plate outside to the balcony and reached over the railing to pick the mulberries. Once I had a handful, I dropped them on the plate I had put at my feet. When their season ended I had filled a gallon-size Hefty zip-up bag with berries, all from that single branch. Here they are below, immersed in water. Most are so ripe that they dye the water, as you can see. I also picked the occasional reddish berry. My readers pointed out that unripe fruit tends to have more pectin, which helps to gel the jam I planned to make. Or compote, fine. 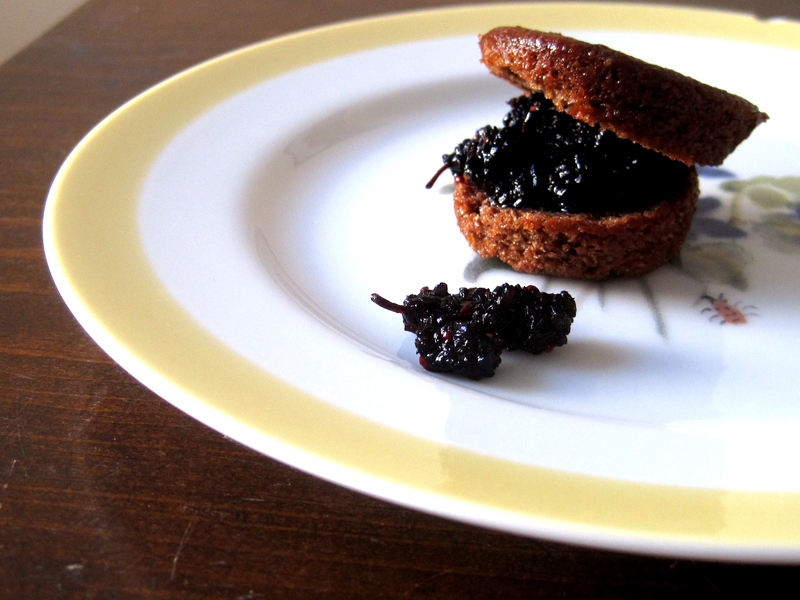 I had this loopy idea a few months back of making some sort of gooey concoction of mulberries and red wine and spices. I’m not much of a wine drinker—I mean, I can tell a quality wine from one I got at a wedding**—so I got some direction from Facebook friends and one very helpful blog reader/vintner from South Africa. I wanted something red, fruity and not dry. Settled on a Bogle Vineyards Petite Syrah, 2010, a California wine. Yesterday, two hours before I had to leave to work a matinee performance, I decided to bite the bullet and make this. Dumped the whole bag of frozen mulberries into my old enamelware pot, turned the jet onto medium high, and stirred in 1 1/2 cups of granulated sugar. I left the stems on, as you can see. But I’ve eaten these berries with their stems for years and I’m not dead yet. 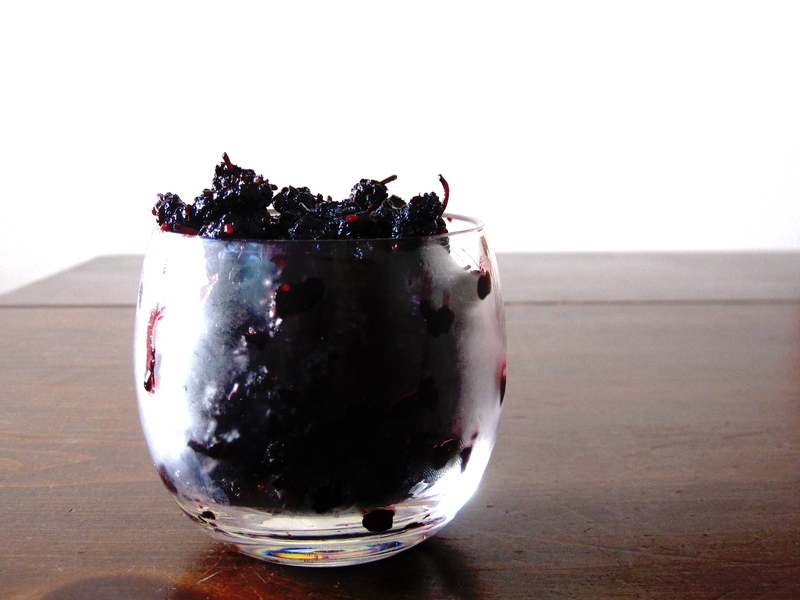 Once the berries had defrosted and started giving up some of their juice, I poured in about 1 1/2 cups of the wine. I also have a huge crush on cardamom, so I threw in a tablespoon or two of that. I measured nothing. Then I turned the heat down to medium and stirred from time to time. The result was somewhat runny, and then cooled to somewhat oozy and sticky. I didn’t taste it at all until it cooled a bit. And you would think a random recipe idea thrown together and stirred as I was zipping around getting dressed would either crap out on me or taste like nothing special. But it knocked me out. 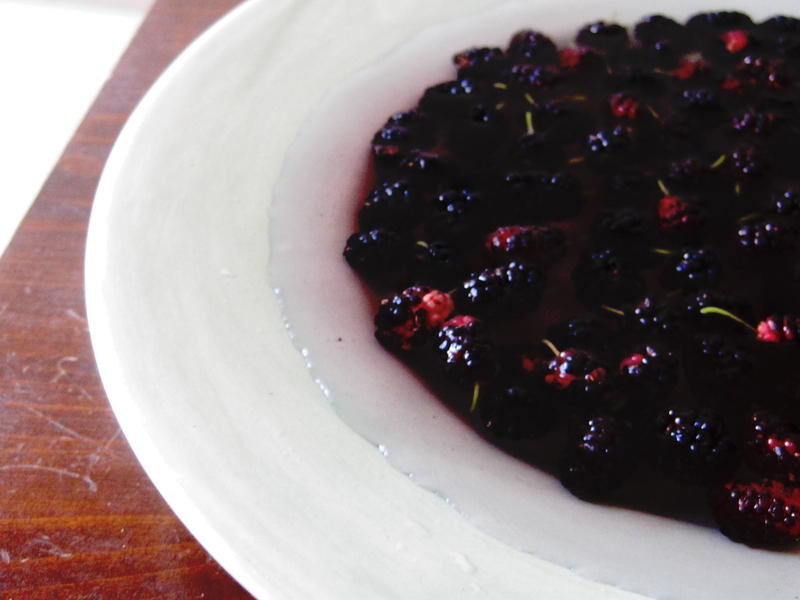 A year or so ago in a blog post for Edible Jersey magazine I talked about fresh, local black raspberries. I said they tasted like a raspberry’s first cousin, who moved to the Left Bank in Paris and spent much of her days looking wistfully out of her parlor windows. This is similar, but the wine gives it an edge. In this case, it’s as if it also sings jazz at a half-empty nightclub in Le Havre. It’s dark and sweet and complicated, rich and addictive. No one was more surprised than me. Now how to consume? You’d think a food person like myself would be more original and less lazy than just to eat it right out of the container with any available clean spoon, but I’m not. This time, though, chocolate called out as a worthy match. I had just made lots of itty bitty Nutella cupcakes, with homemade Nutella in the batter, for the cast of the show I’m doing. I sliced one of the leftovers open, filled it up with the mulberry goo, and popped it. It was a win, in the vernacular of today. In my own vernacular: I have a dozen more baby Nutella cupcakes in the freezer that have their fate spelled out for them pretty clearly. *Since you’re so curious: Marmalade is only made with citrus rind. My ‘marmalade’ had chunks of orange in it—the fruit—but that’s Not Good Enough. Someone decides these things. For the extra curious: Jelly is made from fruit juice. Jam is made from macerated fruit. Preserves are made with macerated fruit plus big happy chunks of fruit as well. Compote is stewed fruit. It’s much looser than the others and good for ladling, etc. It’s one of the nicest things you can do to a pancake. **Swell for scouring burnt caramel out of the bottom of a Calphalon 2-quart pan, or the tub, after you’ve washed your Bernese Mountain dog.